Check in at Dublin Airport for our flight to Mexico City departing at 08:50am via Amsterdam. Upon arrival in Mexico at 19:25 we will meet our coach and guide and transfer to the Hotel Ritz for 7 nights on a half board basis. 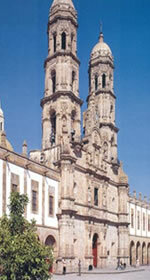 Our hotel is located in the historical centre of the city of Mexico for. En route we will see some of the illuminated city of Mexico. After breakfast we will depart the hotel for the Basilica of Guadalupe. 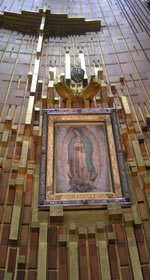 Visit the Chapel of the Cerrito, the ancient Basilica of Guadalupe. Here we remember the apparitions to St. Juan Diego. See also the tilma � the cloak of Juan Diego � with the miraculous image of Our Lady. We will also visit the new and the old Basilicas and the museum. Return to our hotel for our evening meal. This morning we will travel to the Church of the fifth apparition of Juan Diego. Continue to the Pyramides of Teotihuacan, the pyramid of the sun and the moon. Return by coach to our hotel for our evening meal. Today we will depart Mexico and Travel to the city of Puebla de Los Angeles and Abordamos. 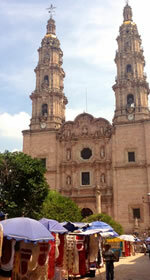 This afternoon we visit the sanctuary of the Virgin of the Remedies and the Church of San Gabriel. En route back to our hotel in Puebla for dinner we will stop off and visit the Cathedral of the Immaculate Conception. After breakfast we will travel to Xhochimilco. Walk in Trajinera and listen to the tradition music of Mexico. We will continue to the Plaza de San Jacinto and the Castle of San Patricio and visit the Church of San Juan Bautista in Coyoacabn. Here we can enjoy a rich coffee and visit the craft market before we return to our hotel fo our evening meal. This morning we will in take in a tour of the city and see the garden of La Borda, the Glory of La Paloma de la Paz, the Palace of Cortes and the famous Chapitel del Calvario. We will continue to Taxco de Alarcon and the city of La Plata to visit the Churcj of Santa Prisca. Return to our hotel in Mexico city for dinner and overnight. Today we will visit the museum of anthropology. The museum contain significant archaeological and anthropological artifacts from Mexico�s pre columbian heritage, such as the stone of the sun � or the aztec calender Stone and the aztec Xochipilli statue. Return to our hotel for our final dinner and overnight. Our morning will be free. This afternoon we will make a return visit to the Basilica of Guadalupe before we transfer to the airport for our return overnight flight back to Dublin via Amsterdam. Depart Mexico City at 21:55. Upon arrival in Amsterdam connect with onward flight to Dublin. Arrive back in Dublin at 16:40.